Chefs compare their fantasy meals and low-brow indulgences. High Paul Virant of Vie in Chicago would fly first class to London with his wife, order the tasting menu at Gordon Ramsay and spend the night in the Tudor Suite at the Milestone Hotel. Low Virant, an F&W Best New Chef 2007, would take his two sons to 2Toots Train Whistle Grill in Chicago twice a week for eight years and order double bacon cheeseburgers. High Fabio Trabocchi of Fiamma in New York City would fly first class to Italy and have a nine-course lunch at Le Calandre, a Michelin three-star restaurant in Rubano. Low Trabocchi, an F&W Best New Chef 2002, would go to Tia Pol in New York City with his dad, Giuseppe, and share their favorite snack, fried chickpeas, every day for nine years. High Michael Schlow of Boston's Via Matta would invite nine friends to a wine-and-truffles dinner in Alba, Italy; they would handpick two pounds of truffles for the seven-course meal. 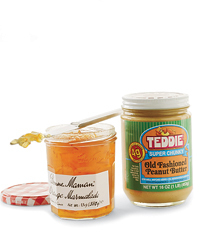 Low Schlow, an F&W Best New Chef 1996, would stock more than 1,800 jars of his late-night musts: Bonne Maman marmalade and Teddie All-Natural Super Chunky peanut butter.